(2) Sweco “Vibro-Energy” 60” and 58” Tub Style Media Tumblers. (5) Vibra-Hone Tub Style Media Tumblers (1)66”, (3)52”, (1)48”. (2) Sweco 44” Dia. Tub Style Media Tumblers. (2) Tub Style Media Tumblers 26” and 19”. Vibra-Hone Drum Style Media Tumbler w/ 40” Dia. x 66” Dual Split Drum. Vibra-Hone Drum Style Media Tumbler w/ 32” Dia. x 50” Triple Split Drum. Drum Style Media Tumbler w/ 32” Dia. x 53” 5-Barrel Drum. (2) Vibra-Hone Drum Style Media Tumblers w/ 36” Dia. x 46” Dual Split Drum. Vibra-Hone Drum Style Media Tumbler w/ 34” Dia. x 48” Dual Split Drum. (2) Drum Style Media Tumblers 24” Dia. x 36” and 20” Dia. x 10”. PFS Professional Finishing Systems Media Tumbler w/ 16” x 52” Tub. Cement Mixer Style Media Tumbler. Over 100 Barrels of Ceramic and Plastic Tumbling Media. Media Spin Dryer w/ 15” Barrel. Vibratory Separator w/ 14” Belt Drive. Vibratory Separator w/ Slues Style Catcher. Ciasons mdl. SS-4860VQA 5Hp Vertical Air Compressor w/ 60 Gallon Tank. 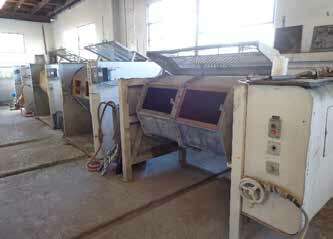 Plastic Process Equipment Dual Drum Mixer. Trinco mdl. 48X30SL/BP Dry Blast Cabinet. Hodler “Optivac” Vacuum System w/ Tank. (2) Yale 1 Ton Electric Hoists w/ Trolleys. Craftsman Roll-A-Way Tool Box and Tools. Nissan mdl. MCPLO1A15LV 3346 Lb Cap LPG Forklift s/n CPL01-9N0544 w/ 3-Stage Mast, 187” Lift Height, Side Shift, Solid Tires, 1233 Metered Hours.